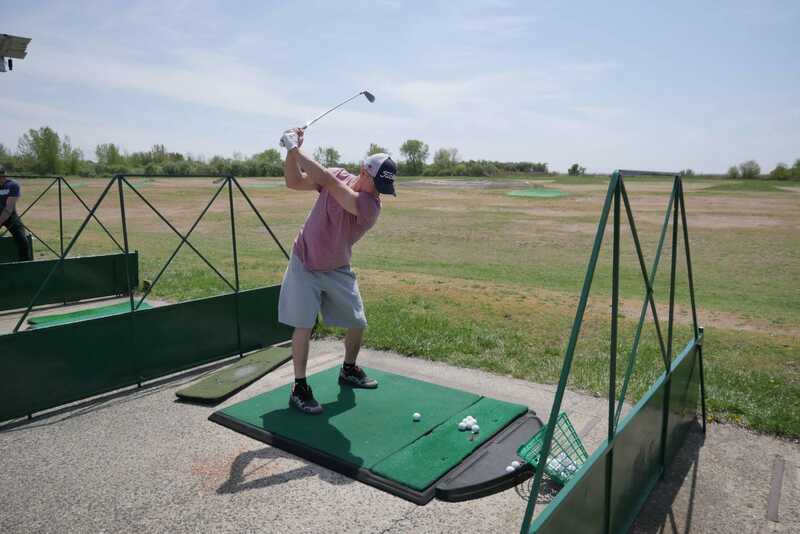 As Brooklyn’s only full-sized driving range, we strive to make the Range a complete golf practice facility. In addition to our 75 stalls (25 of which are covered and heated for year-round use), the facility also has a putting green, chipping area, practice bunker, and a large natural grass tee area. With each of these areas being fully lit, you can practice every aspect of your game long after the sun goes down! So stop by today to explore and enjoy the facilities. Be sure to bring the whole family too. Get a LOYALTY CARD (no charge): Purchase 10 buckets and get 11th bucket free. There is a $5 deposit for tee rentals. To receive the deposit back please return the borrowed tee before leaving the facility on the day of rental. Having a birthday party or family function? Let us book your party! Our parties department provides food, drinks, cake a dedicated party host, balloons, table covers, e-vites, paper goods, utensils and ice skating gift certificates for each child attendee. Please contact Parties at party@aviatorsports.com. Weekdays 2:00 p.m. – 8:00 p.m. Weekends: 9:00 a.m. – 8:00 p.m.
Riis Park is now open for the season! Hours of Operation: 8:00 a.m.-7:00 p.m. Last tee off at 5:00 p.m.
Riis Park Par 3 Picnic and Barbeque Area is available only through outing rentals. With all outings, you have access (upon availability) to our picnic area for our award-winning catering. To secure a date and time Please call (718) 758-7520 for more information. Aviator Golf Center is Brooklyn’s full-service practice facility. Our goal is to create extraordinary experiences for all of our guests by delivering great service, great instruction and an overall fun environment at all of our locations. Always a welcoming sport for newcomers and veteran players alike, our Minature Golf Course is both reasonably challenging and accessible for all skill levels. Our Driving Range is the definitive way to polish your swing for kids and adults alike, along with also being a serene spot to soak in the locale and let loose on during your downtime. Riis Park Par-3 is the most well-rounded of our facilities, where you’ll be able to practice your short game. Enjoy the day with a date or your children; we will make every effort to make your time with us as pleasurable as possible. The Driving Range and Miniature Golf Course are located at 3200 Flatbush Avenue, Brooklyn NY approximately 1 mile off of Exit 11S on the Belt Parkway. Our 18 hole 3-Par Course is located just off the boardwalk at Riis Park Beach in the Gateway National Park System. It is just minutes from the Marine Park Bridge. Monday, Tuesday, Wednesday, Friday: 8:00 a.m. – 8:00 p.m.
Saturday-Sunday: 8:00 a.m. – 8:00 p.m.